Janet entered our travel writing competition, “Clash of the Protons” as featured in the 2012 edition of our Cloud 9 magazine. She travelled to Iceland in 2010. Bob and I both match snowballs, round, plump and pale. Typical of my luck, I booked a 3-day trip to Iceland for May 2010 (Bob’s 70th birthday) before which, the volcano Eyjafjallajokull erupted! Friends suggested we re-book – but not us! The main day of our 3-day trip involved a day trip to a glacier. 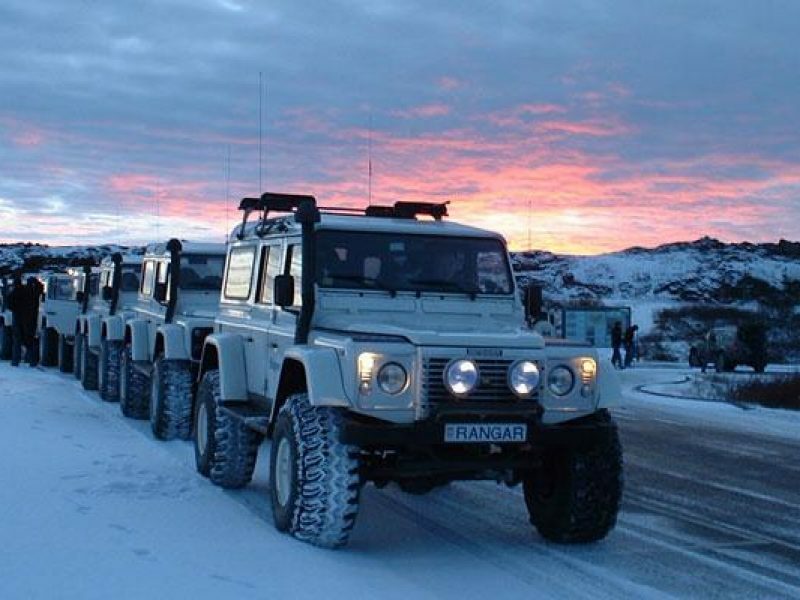 An extremely rugged, white, sporty-looking Landrover Super Jeep (number plate – ‘RAGNAR’) arrived, driven by an equally rugged, blond athletic Icelander named Ragnar, our fitness-challenged persona gave us mixed feelings. Seven of us climbed into the Jeep, making 8 in all with Ragnar. Bob and I were in the back three seats. Travelling with us was another couple our age, a keen, young, couple who wanted to stop off and go snowboarding and a single lady who rode shot-gun the whole journey – a wily decision I realised later. The sun shone as we travelled, the snow became thicker and higher and the road narrower. All was going well especially after enjoying a wonderful lunch of home-made soup and fresh bread in a beautiful old Icelandic-style restaurant. We felt warm and comforted. The afternoon proceeded in an interesting and unexpected manner! Ragnar, an Icelander with incredible local experience and a brilliant driver, told us things that amazed us about life in Iceland. He added a ‘morsel’ about the custom of eating horse (they bred them specially) which is now frowned upon. More of that later. The Jeep came to a sudden halt. The wheels spun and spun but there was no way we were moving. The view around us was, well – WHITE, not a person for miles and so quiet but at least the sun was shining. However, THAT was our problem. The warmth had melted the snow, and together with the increased traffic ahead of us had resulted in deep grooves and watery potholes, in which we had gracefully landed. Ragnar started to dig and put down boards, but to no avail. We rallied round and all got out to ease the weight (Bob and I helped a lot in this respect) and the men all helped with the digging. Ragnar contacted the other Super Jeep driver named Rangar (yes, I know) and with, guess what, on his number plate? However, they were a mile ahead of us and not really able to help immediately. During the dig I had a yearning. Having seen a fellow male disappear in like fashion, off I trotted, following his original path. Every step I took, my legs went deeper and deeper into the snow. I was becoming a bit worried and scared, especially when the snow fell into my long boots. Very relieved, I attempted the trek back, only falling over and nearly burying myself twice! I was reassured by the sight of the jeep and that they hadn’t left without me! Eventually Ragnar started up the Jeep and, with one man standing on the running board, each side(!! ), it gripped and moved forward. Jubilation. No glacier but it was an exciting, eventful and amusing day. That evening, Bob and I celebrated at a restaurant I’d noticed advertised in the airline magazine. We had THICK steaks – beautifully juicy and tasty. It was a first!! Last day – picture two chubby pensioners (with huge smiles) wading into warm, blue water and covered with silica to soften their over-aged skin. They enjoy refreshing drinks from the bar in the middle of the Blue Lagoon. Bliss! An hour later, they were at the airport heading home. Yes, “Little Britain” went to Iceland.